The eighth edition of the prestigious Tenerife Ladies Open (TLO 2008) takes place from 19-22 June 2008 at Costa Adeje golf course (pictured right). The event will attract 120 professional players including some of the top names in the world of ladies golf from Germany, France, Italy, Sweden, England, New Zealand, Australia and India. The tournament, organised by Turismo de Tenerife, is part of the Ladies European Tour. Prize money this year amounts to over 40,000 euros. 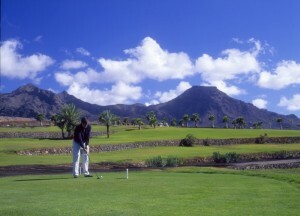 Tenerife has hosted the Tenerife Ladies Open since 2002. It is a very important event for the island because, as well as being one of the major highlights on the women’s golfing calendar, it is also an excellent promotion for the island as the perfect place to play golf all year round. Last year, the tournament proved to be an efficient promotional tool for marketing Tenerife’s attractions as a golf destination and its talent for hosting major sporting events. The Tenerife Ladies Open 2007 was staged at Golf del Sur and the winner was Nikki Garrett.